Painting conservation treatments have been proceeding systematically on a schedule over approximately the last 12 months. Two receptions/open houses have been held at the Archives to inform patrons, members and donors to the project and the response was very enthusiastic. At these receptions, completed works were shown next to painting that were yet to be cleaned, therefore offering an opportunity to compare. Art conservation staff was on hand to tell stories, explain processes and answer questions. 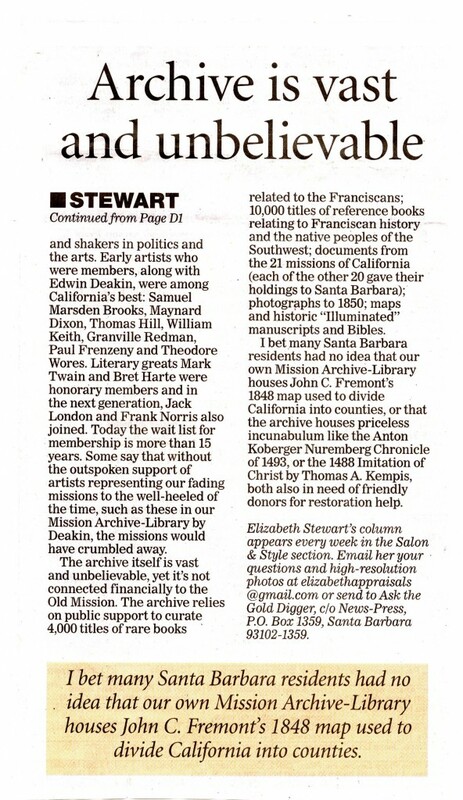 Scott M. Haskins spoke to the groups of about 100 people at each event with background info on this wonderful collection of art and a review of other collections of paintings of the Missions of California by Henry Chapman Ford and William Sparks. Videos of the processes are currently being made and a review page of the project on this website will be established in the future. The completion of the project is estimated to take place by the end of August 2015. Feel free to leave comments and “like” this page. 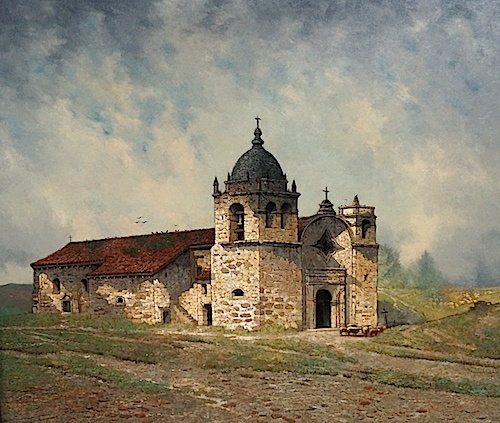 This entry was posted in In Lab, Painting on canvas and tagged Conservation-restoration, Edwin Deakin, Santa Barbara Mission, Spanish missions in California. Bookmark the permalink. You’re welcome Emily. Glad you enjoyed it. Thanks for commenting. Another great job! Learning how these paintings can be saved has been a pleasure of mine the last few years! Thank you for sharing your successes! Absolutely enjoyed learning about art restoration. Thank you for taking your time to show us your magnificent work too. I’ve had the pleasure to have a look at the murals being restored by fine art conservation at the Cedar Rapids city hall. Mr. Haskins and his crew are real master restorers. We are so excited to see this collection restored to its original state. So far the ones that have been completed look amazing! Thanks for talking to our group. Job well done! 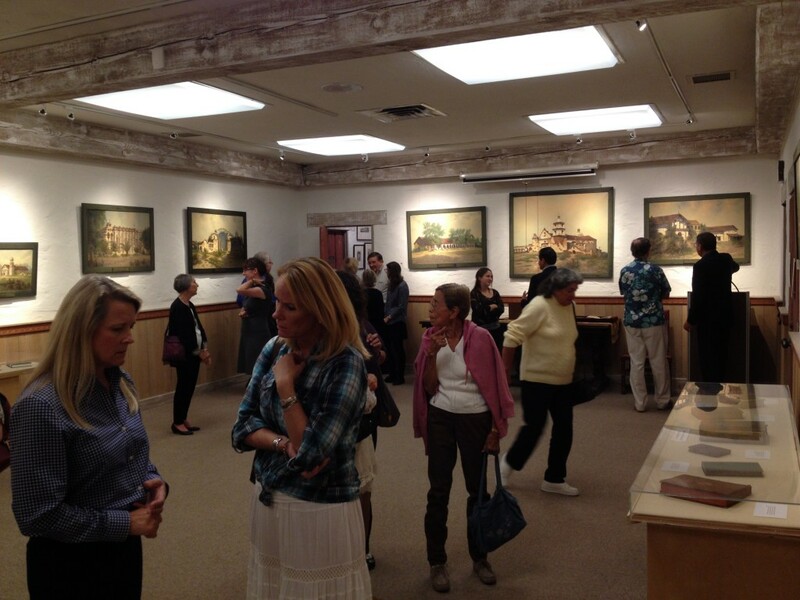 This collection of paintings are so historical and important for California history. The Franciscan Mission archives is so fortunate to have this treasure. What great fortune to have found your company to clean and safeguard these irreplaceable works of art. We love the work you are doing and appreciate your way of explaining the processes. Thanks Ethan. Very nice comment. I was captivated by your presentation at the archives.,, truly captivated by your stories. I love the quality of the work you are doing, the careful attention you have given this work and I appreciate your way of explaining the processes. Thanks Riley for the nice comment!! You are welcome Fiona. It was my pleasure. Thanks Vivian. It was a fun event… and I didn’t see anyone fall asleep! Thank you so much for setting aside the time to explain the restoration process to us. You do fabulous work. This collection is so amazing. Thank you for speaking…..we had so much fun listening to you! Thank you so much for your great work and setting aside the time to give us the grand tour. The change is amazing in the cleaning process! What you do is so interesting and you’re great at it! 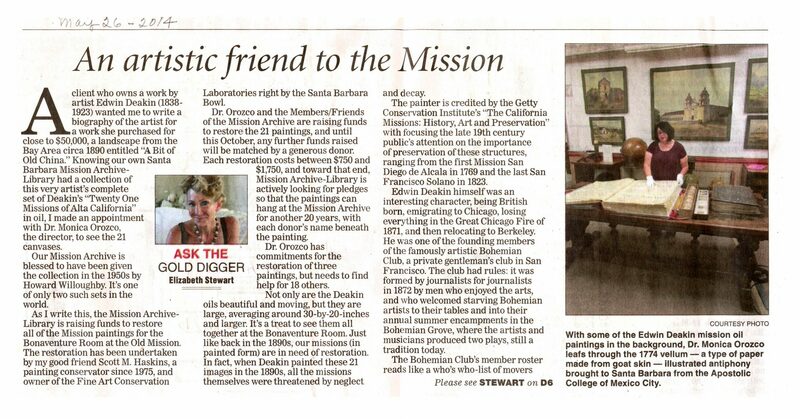 We applaud Dr. Orozco for choosing you to do the art conservation work. It was very pleasant to have you come by the lab for a tour Andrew. Thanks for being involved in this project. I think its a project from which anyone would be get great satisfaction from being more involved. I too am very happy to support this worthwhile and exciting historic project. Thanks Bianca. We are so grateful for your expertise; you have enlightened us so much! We are so glad we donated to the restoration of these wonderful paintings. Thank you so much for giving us the tour of your laboratory. What you do is so interesting and it’s great to know that you’re in town and that you are taking care of the SBMAL collection. We are so glad to have donated to such a great cause! These paintings are so important in our history and you have brought them back to life! Congratulations to Dr. Orozco to have chosen your company to work with!